Remade as The Happiness of the Katakuris by Takashi Miike, The Quiet Family may lack that film’s zombies, claymation sequences and The Sound of Music parodies, but has much which Miike held on to. 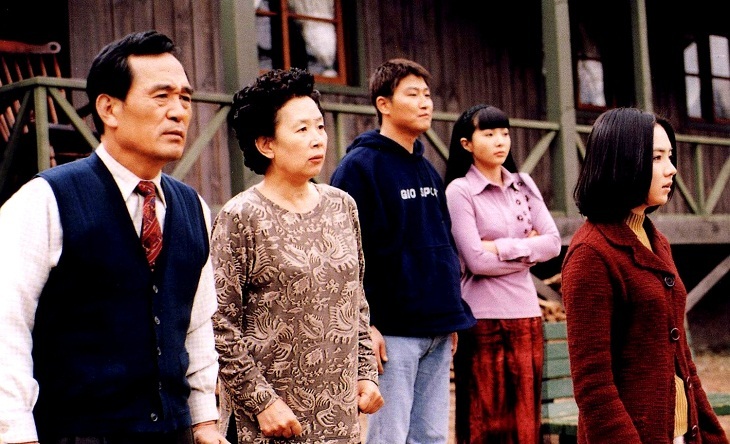 Essentially, the plotlines are the same – a family buys a mountain lodge; a number of guests are killed off either by themselves or by others; the family attempt to cover them up – whilst Kim Ji-Woon’s original is a similarly odd concoction. After all, it features one of the more eclectic soundtracks to feature in a Korean movie, from the mariachi-flavoured hip-hop of Tres Delinquents, which accompanies the opening credits, to the likes of the Partridge Family, the Stray Cats and long forgotten eighties goth band Love and Rockets elsewhere. Indeed, The Quiet Family may best be regarded as an acquired taste. That said, this is a film which is likely to travel well. The cast members’ subsequent credits include the likes of Joint Security Area, OldBoy and Shiri, which is likely to attract interest, whilst director Kim went on to make A Tale of Two Sisters. Moreover, The Quiet Family possess a fine, mordant wit; it’s not so much a black comedy as bleak comedy. Certainly, anyone expecting something a little more madcap owing to its subject matter may very well come away disappointed. Rather the humour is decidedly deadpan, a situation which serves the film to a better degree. There are no noisy attempts at winning the audience over, simply an acceptance that those with a taste for such comedies – and The Quiet Family is primarily a comedy – will find the film on their own terms. Yet in being so low key, Kim does have a problem in sustaining momentum. The bodies may pile up soon enough, yet it’s questionable as to whether he has anywhere to go. From the opening scenes we get nods towards the horror genre (ominous crane shots and aural rumbles à la The Evil Dead), yet these are never truly latched onto. Likewise the thriller elements – courtesy of the arrival of a gangland hitman as well as a police officer in the latter stages – are never developed as fully as they could be. As an aside consider Shallow Grave or Les Diaboliques which both gained more mileage from a single corpse – perhaps Kim has simply bitten off more than he can chew? Indeed, The Quiet Family has a ragged quality which is perhaps unsurprising for a debut feature. It succeeds in the quieter moments (many of the film’s delights come through the petty family antagonisms as opposed to the bigger set pieces) and more than gets by on them, but there is a continual feeling that in order to be more than just a good film it needs something a little extra – most likely a dash of suspense or a greater sense of direction. Certainly, the latter element can be detected during The Quiet Family’s conclusion as rather than build to a finale, it simply peters out. In the Beginning is the story of a small time crook who falls into a big con and thereby becomes both a hero to the locals and a mensch in his own eyes. The con and the project are doomed, but both are sweet while they last. This suspenseful and curiously moving film includes a virtuoso lead performance by François Cluzet, was in competition at Cannes, and received eleven nominations at the French César awards. Director Xavier Giannoli (of The Singer) has again made a picture that's a sensitive study both of in individual and of a region. He also succeeds, like Lucas Belvaux in Rapt, in turning a news story that might seem on the face of it rather trivial into psychological and philosophical thriller. It makes you think, it keeps you on the edge of your seat, and it shows once again that the French really know how to make movies. Paul (Cluzet), who uses the fake name Philippe Miller, is a petty con man who travels all around France Xing off construction projects on his highway map of the country. Taking down names and phone numbers from roadside signs and making deft use of product catalogs, he steals and resells parts and equipment from suppliers by pretending to be a project manager. Miller hits pay dirt, and ultimately gets in much deeper than he plans, when he comes upon a highway project abandoned two years earlier due to its invading the habitat of a protected beetle. Faking involvement with the parent company in the project, he collects money and starts it up again. Miller meets the eager, energetic Monika (Stéphanie Sokolinski, the singer known as Soko), who works at his motel, and her fresh-faced, sensitive boyfriend Nicolas (Vincent Rottiers). Before long he also meets the local mayor, Stéphane (Emmanuelle Devos) and becomes her lover. Miller gets a local bank to issue him checks and advance funds for payments to suppliers that demand immediate payment. The bank wants a piece of the action too. But they will require authentication that Miller can never provide. As the project takes off, Cluzet, as Miller, at first seems to be imploding. When asked embarrassing questions, he has a dozen ways of deflecting them. If all else fails he just says he has another appointment and runs off. The situation is too tempting for Miller to resist. He knows he's getting in way over his head. But isn't it the nature of the con man to seek bigger and bigger deceptions? Actually nobody loses much here. The whole thing that terrified Miller begins to delight him. For once he is somebody. "I have wasted a lot of time" is one of his saddest lines to Stéphane, in bed. Of course ultimately Miller is going to go to jail, but he starts desperately trying to get the segment of highway completed before the time limit on payments ends and many bills become due. He's now paying out in salaries to the workers all the many thousands he accumulated at the outset. The money doesn't matter to him any more. He becomes a worker himself, pushing a broom to spread the asphalt in the rain. It's winter and the project is becoming more and more difficult to finish. Cluzet, an extremely busy and popular French actor most recently seen by American audiences in Guillaume Canet's Tell No One (another hit thriller), is a neutral Frank Capra everyman, an individual who can seem shut down, but with a twinkle in the eye, a grump with a jovial chap hiding inside waiting to be let out. The film gradually lets out that chap, and then, when the big corporation comes in and the police descend, the highway project lit up at night like a film set, Miller is a little man who's strangely triumphant in defeat, waving the battered flag of his fake company. This is another marvelous French film that transcends genre, turning a crime thriller into celebration of work. Judging by this and Giannoli's The Singer/Quand j'étais chanteur, he has great sensitivity to solitary wanderers and paints rich psychological portraits in a complex social environment. He doesn't know so well how to end things. There is a little uncertainty whether we can take À l'origine as a mood piece about economic desperation (as Up in the Air partly is; but this is Down on the Ground), a process picture, or a crime thriller. But it achieves success in each genre, because of the energetic world the director creates, the rich moral ambiguity he preserves. The secondary characters are of course a bit schematic, a bit obvious, but with such actors, they never seem that way. Like Laurent Cantet's study of a strike and of class conflict within a family, Human Resources, In the Beginning is about the human need to be doing work.